Since these questions are closely related and of similar difficulty, it makes sense to add them together. Notice also that Pew’s interviewers were instructed to accept both English and Hebrew answers to (a). The last four questions were multiple-choice, with “Do not commit adultery,” “Do not steal,” and “Keep the Sabbath holy” the other options for (b), and with Job, Elijah, Moses, and Abraham the options for (c) to (e). I would expect a bright child in Sunday School to get 5 out of 5 on these questions, and just guessing should average around 1 out of 5. 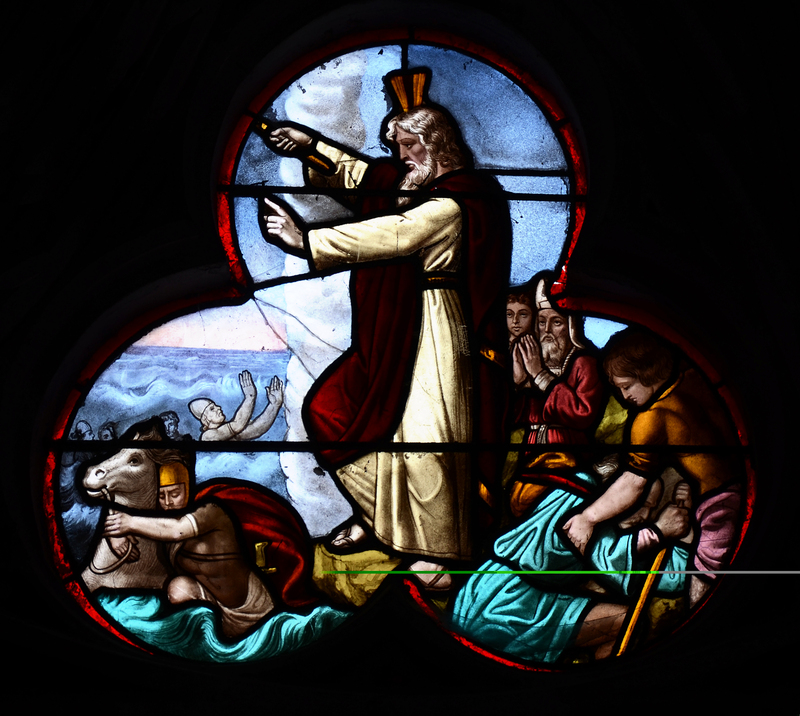 Which Bible figure is most closely associated with leading the exodus from Egypt? 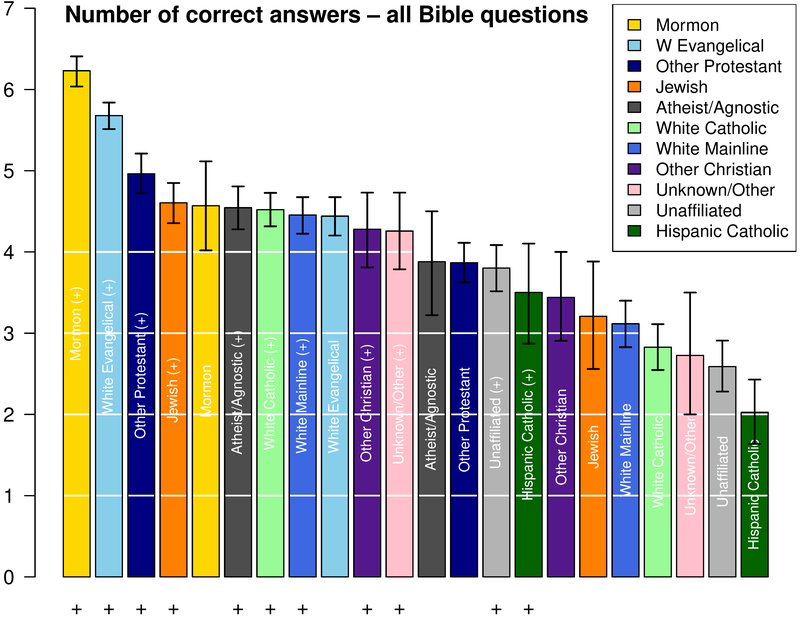 Mormons do best (4.5 or 3.4 questions right, depending on education subgroup). White Evangelical Protestants come next (4.0 or 3.1). Both Mormons and Evangelicals put great weight on Bible study, so this makes sense. Then comes a group of three with similar results: Jews, Other Protestants (including Black Protestants), and Atheists/Agnostics. Orthodox Jews put great weight on studying the Torah, but many Jews in the US are in fact fairly secular. More interesting is the high score for Atheists and Agnostics – they do seem to have some knowledge of the beliefs they are rejecting (Atheists and Agnostics also scored highest on the complete survey). Then comes a group of five: Other Christians, Unknown/Other, White (non-Hispanic) Catholics, White Mainline Protestants, and Unaffiliated (“nothing in particular”). Notice that White Mainline Protestants (ABCUSA, UMC, ELCA, PCUSA, UCC, RCA, Episcopal, etc.) get about one question less right (3.1 or 2.1) than their Evangelical counterparts, reflecting less of an emphasis on the Bible in mainline denominations. The lowest scores were for Hispanic Catholics (2.7 or 1.5 questions right, depending on education subgroup). Given that guessing gives an average score of 1, this suggests that many Hispanic Catholics in the US have a rather tenuous link to their faith (many of them appear to strengthen this connection by becoming Protestants). Thus if the Hebrew Bible (Old Testament) is a religious meeting place, it is a meeting place between Mormons, Evangelical Protestants, Jews, and (ironically) Atheists and Agnostics. 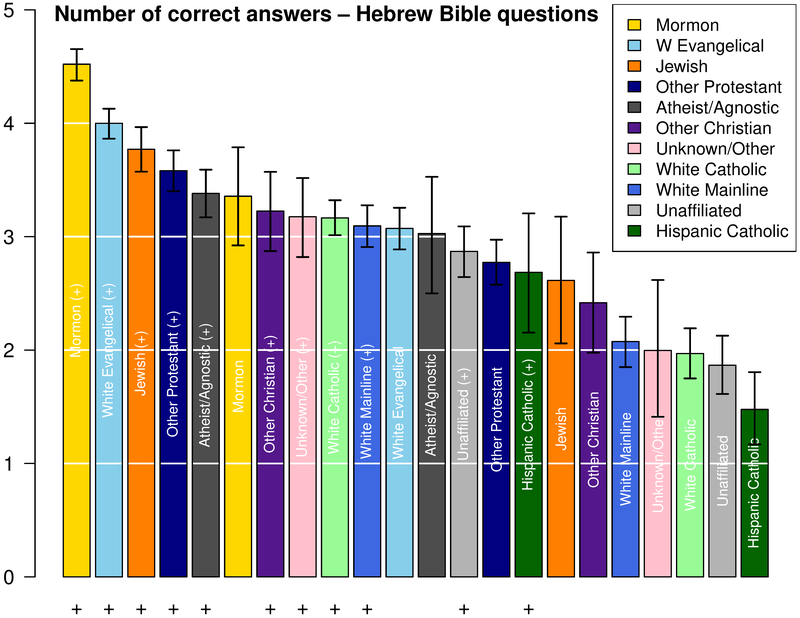 It is also interesting to see what happens when we add two simple questions about the New Testament – “Where was Jesus born?” and “Tell me the names of the first four books of the New Testament of the Bible, that is the Four Gospels?” Not surprisingly, Jews now do worse, since the New Testament applies specifically to Christianity. Atheists and Agnostics also do a little worse – apparently they know a little less about the New Testament than about the Old. In spite of the interviews being conducted in English and Spanish, Hispanic Catholics continued to do poorly, with less-educated Jews and Hispanic Catholics providing the wrong answer to “Where was Jesus born?” more than half the time. 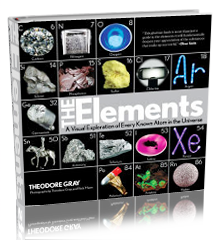 In the spirit of the wonderful photobook The Elements by Theodore Gray (which I have previously blogged about), starting a collection of elements is a great way of introducing yourself (or your children) to basic chemistry. 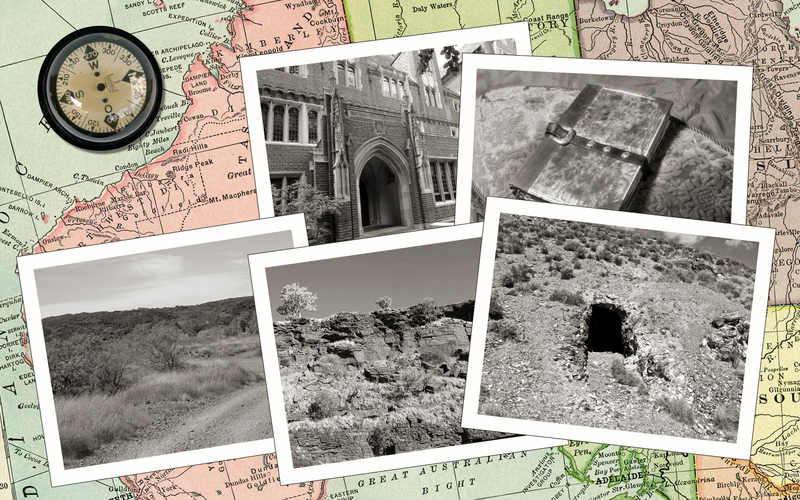 Here are some suggestions, and a list of 24 elements to start with…. 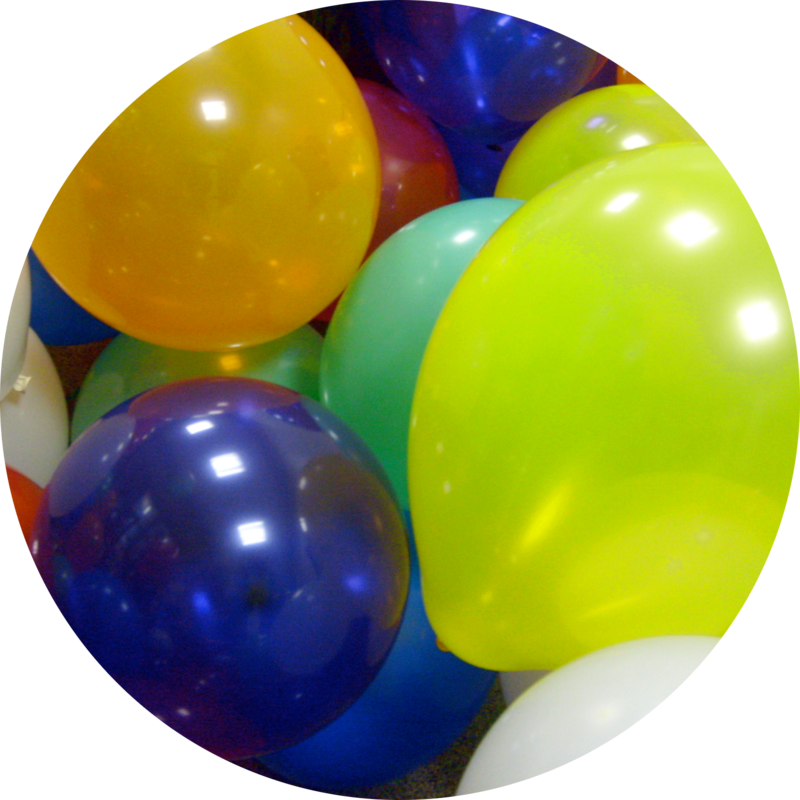 Helium is lighter than air, so balloons are often filled with helium. 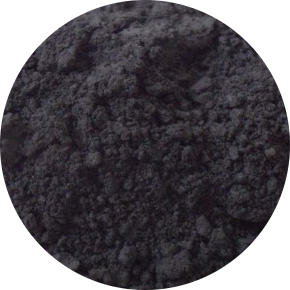 Carbon is most easily added to your collection in the form of charcoal. 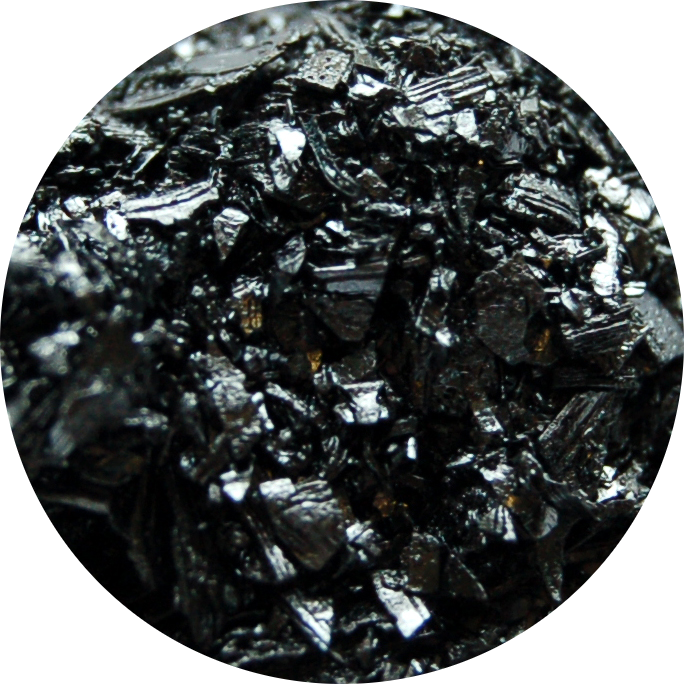 Zinc–carbon batteries have a carbon rod at the centre. Air is about 78% nitrogen. To add nitrogen to your collection, just fill a small bottle with air. 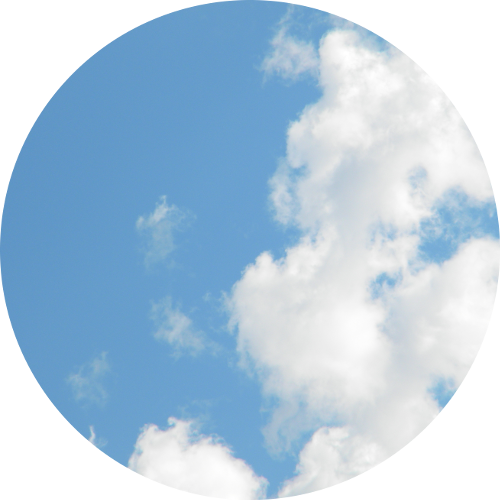 Air is about 21% oxygen. To add oxygen to your collection, just fill a small bottle with air. Fluorine is a toxic gas. 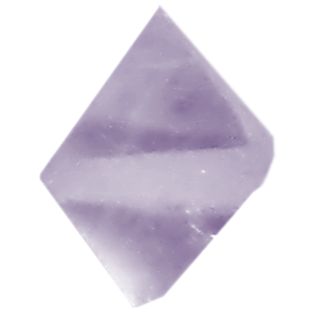 But octahedral fluorite crystals (calcium fluoride, CaF2) make a great addition to a collection. Sodium is a reactive metal which will spontaneously catch fire when in contact with water. But sodium chloride (ordinary table salt, NaCl) is perfectly safe. 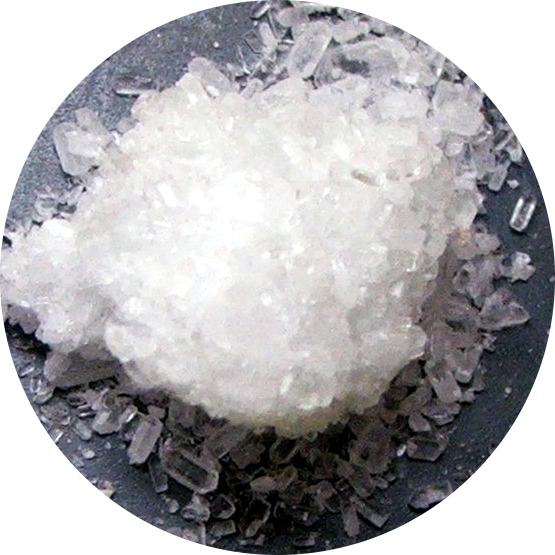 Magnesium is a flammable metal, but you can substitute crystals of Epsom salts (magnesium sulfate, MgSO4), which can be obtained from a pharmacy. 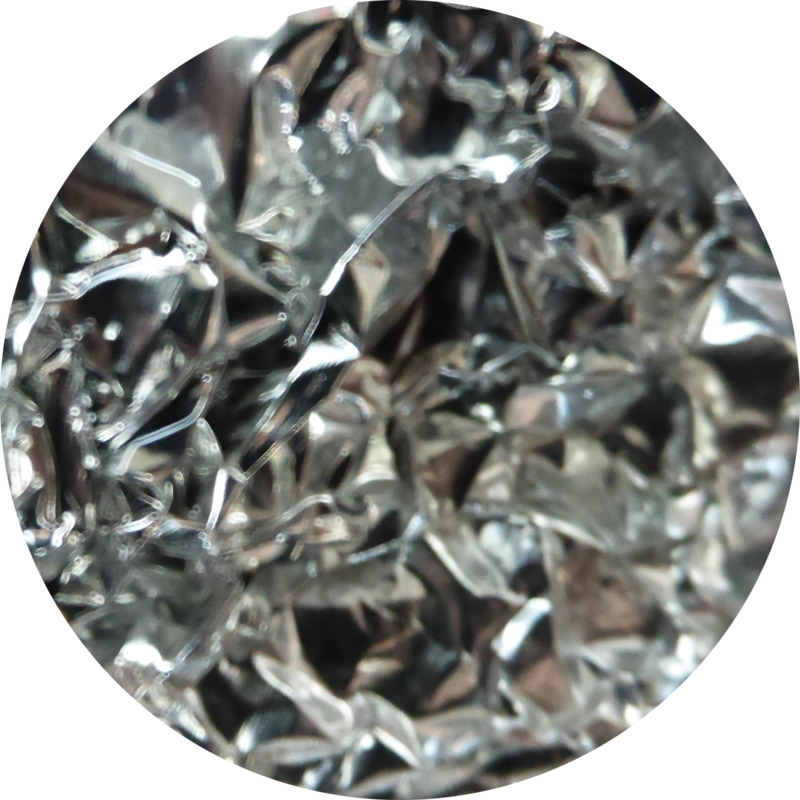 Aluminium (aluminum in the USA) is most easily available as aluminium foil. 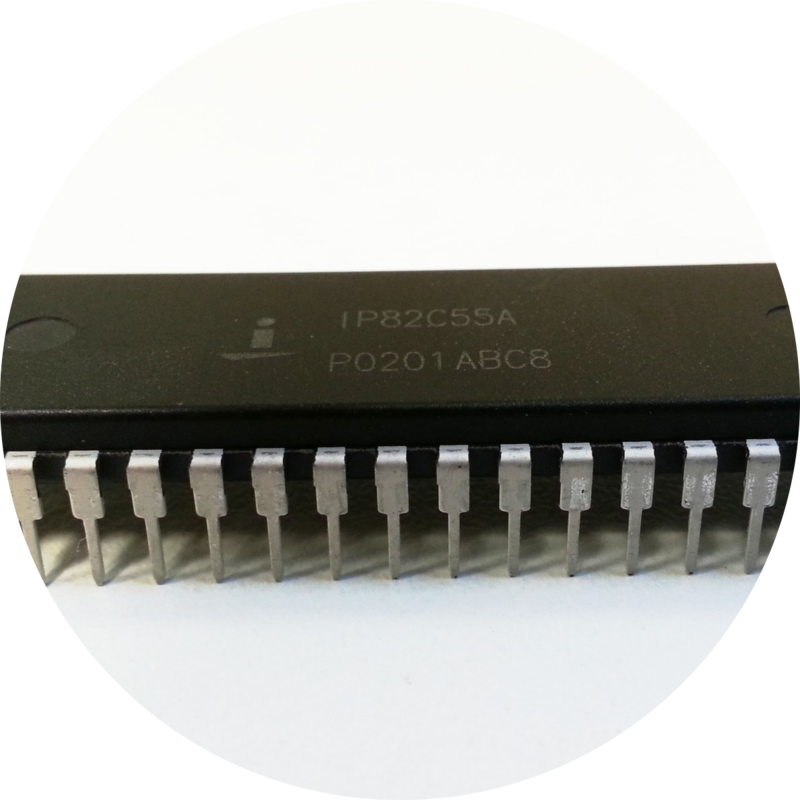 Silicon is widely used in transistors and integrated circuits (chips). 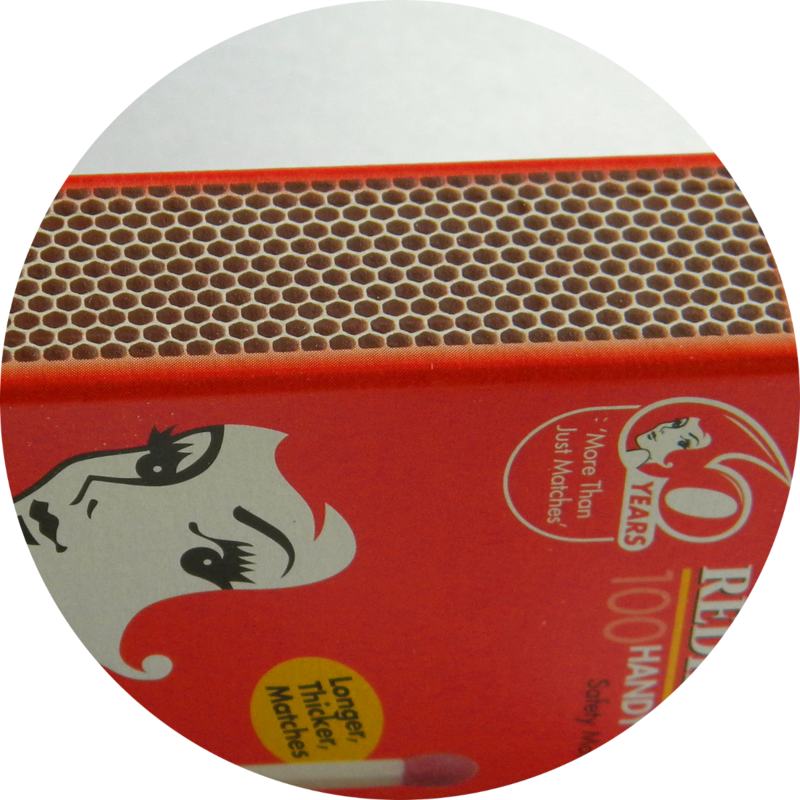 The side of a box of matches is largely composed of phosphorus. 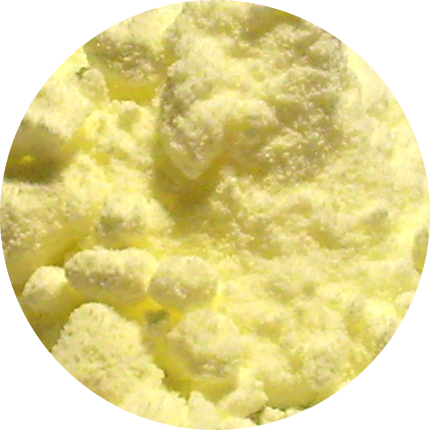 Sulfur powder, also called “flowers of sulfur,” is available from pharmacies. Chlorine is a toxic yellowish-green gas. 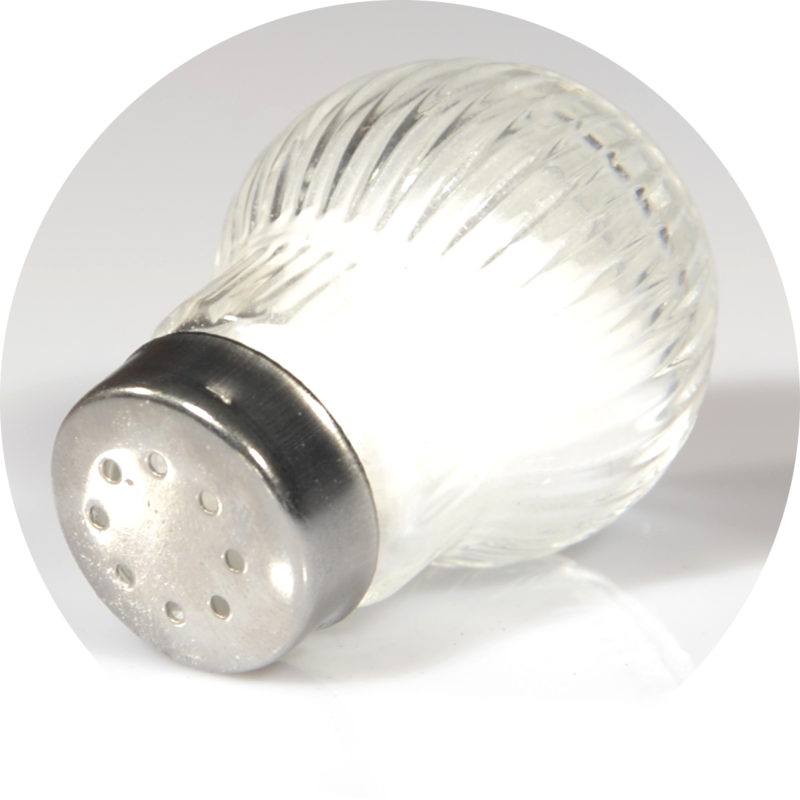 But sodium chloride (ordinary table salt, NaCl) is perfectly safe. 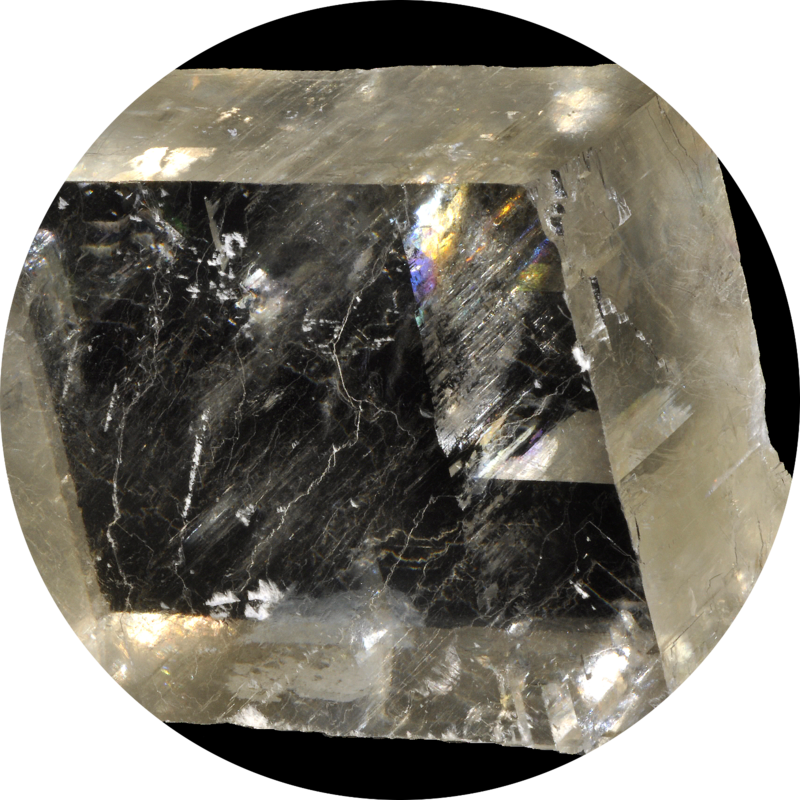 Calcium is a reactive metal, but you can substitute crystals of calcite (calcium carbonate, CaCO3) or gypsum (calcium sulfate, CaSO4). Chromium is used for plating (“chrome plating”) to prevent rusting. Also, “stainless steel” is between about 16% and 25% chromium. Iron is one of the most widely used metals. 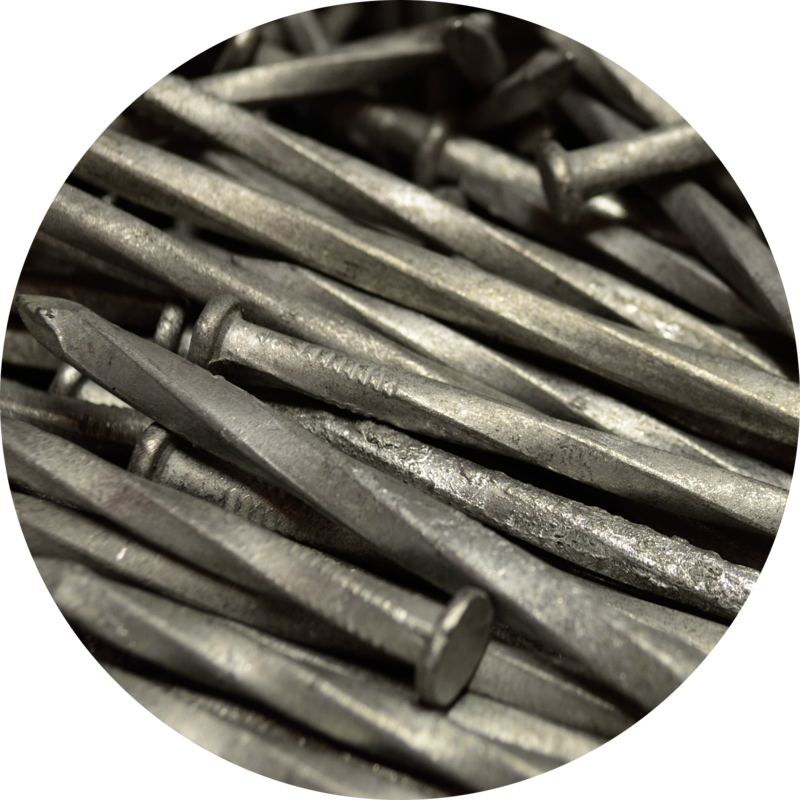 Iron nails are easy to add to your collection. Like nickel and cobalt, iron is attracted by a magnet. 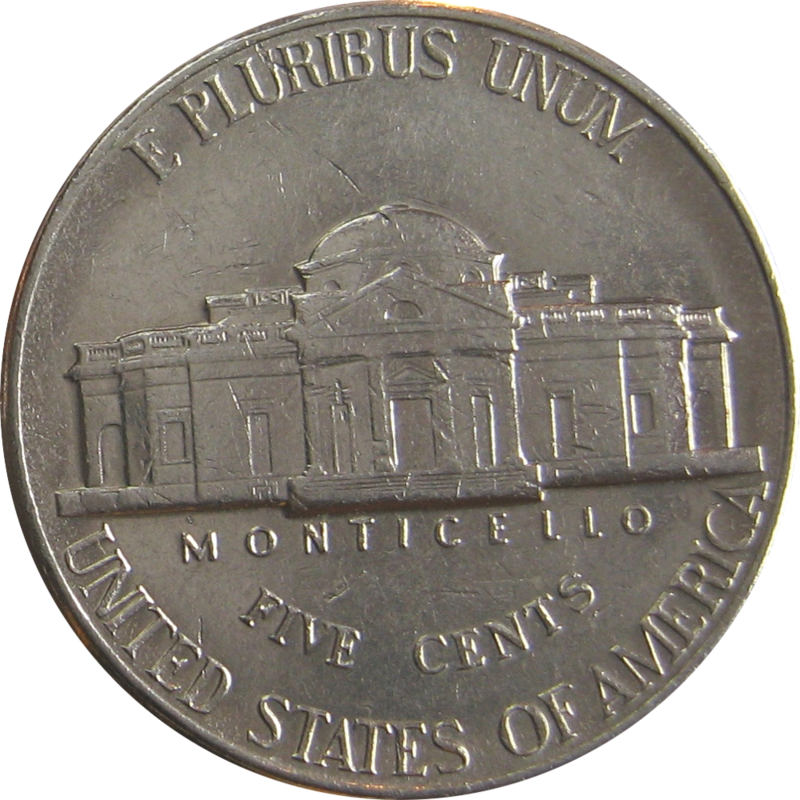 The United States “nickel” coin is actually only 25% nickel (and 75% copper), but objects made of pure nickel can be found. Indeed, Canadian “nickel” coins from 1955–1981 are almost pure nickel. Copper pipes are widely used in plumbing. 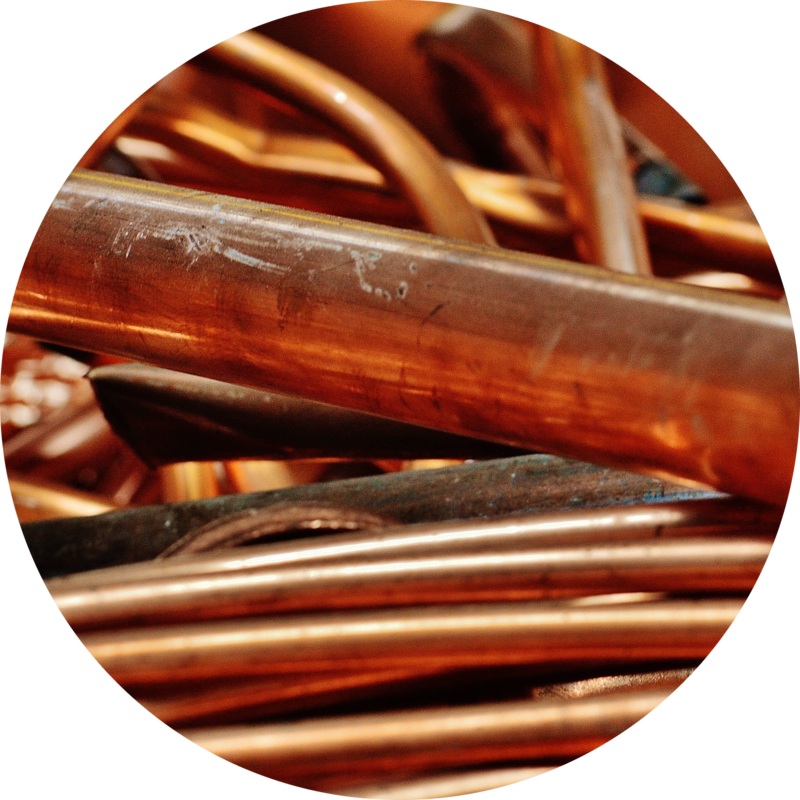 You can buy copper plumbing fittings, or get offcuts of pipe from a plumber. Copper electrical wire is also easy to find. 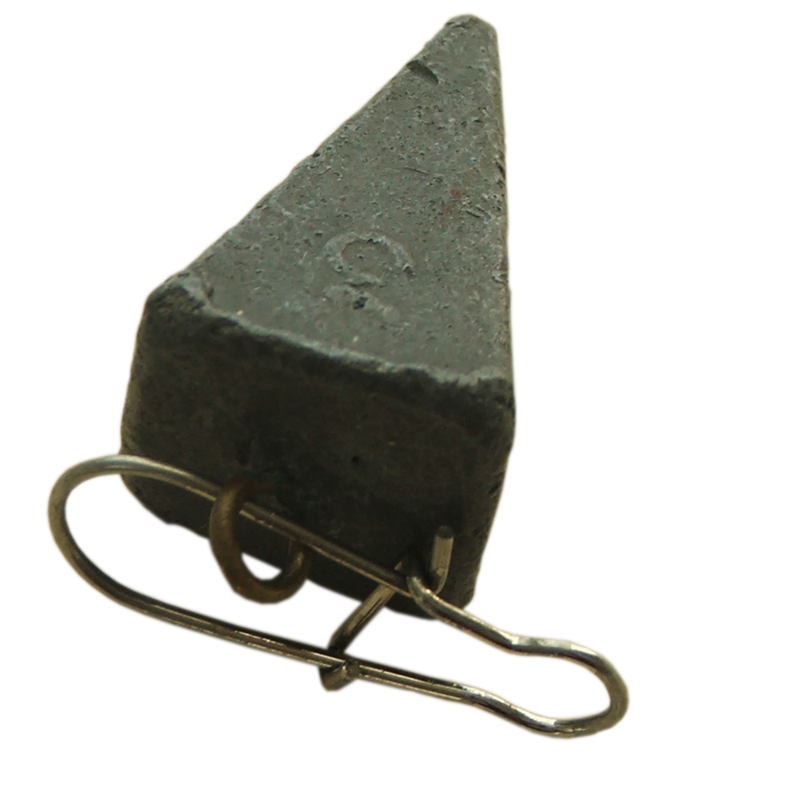 Galvanised iron is coated with zinc to prevent rusting. Also, filing off the copper coating on a US penny reveals a coin made mostly of zinc. 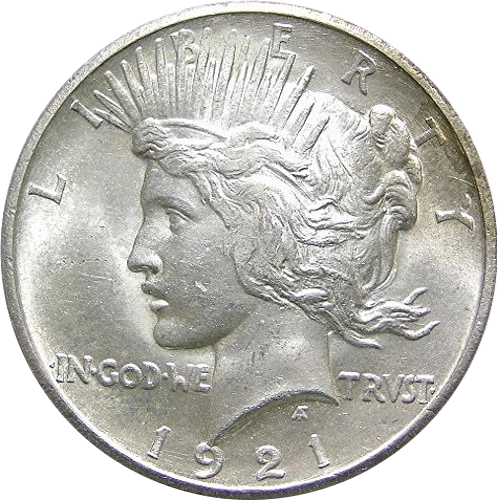 A silver coin, or a piece of silver jewellery, would make a fine addition to your collection. 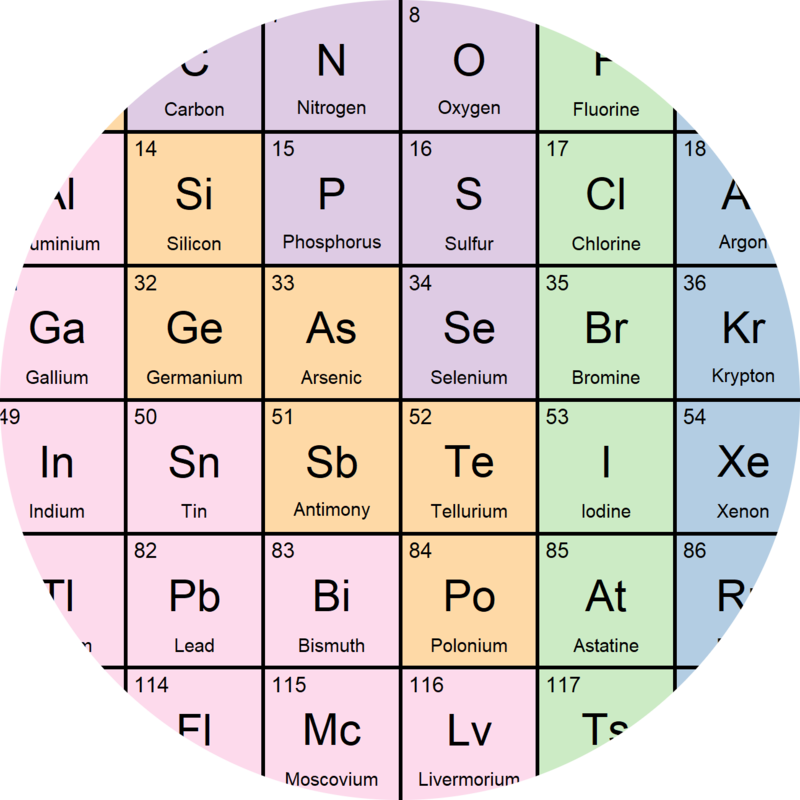 Neodymium is one of the “rare earth” elements. 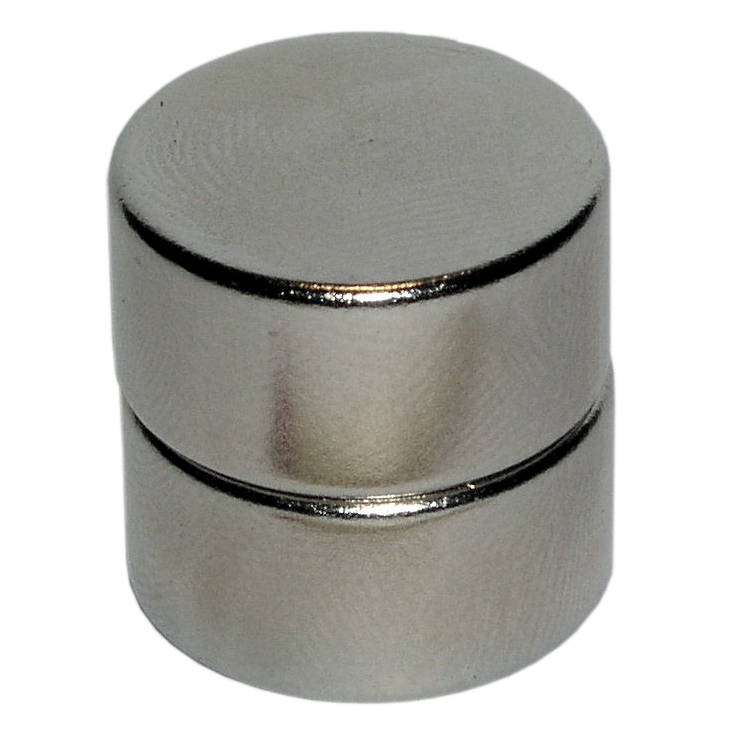 Neodymium magnets are the most common form of strong magnet. 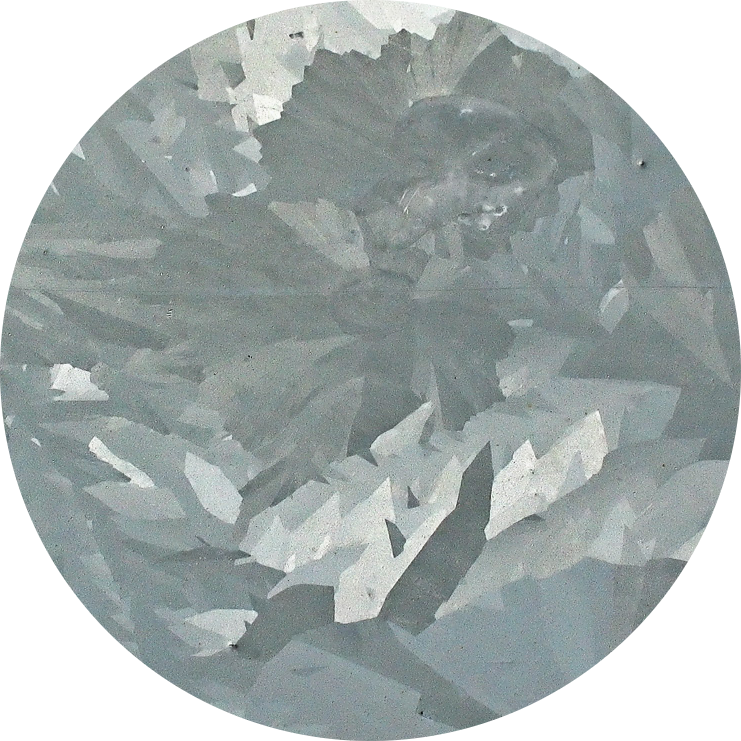 They are made of an alloy of neodymium, iron and boron (Nd2Fe14B). 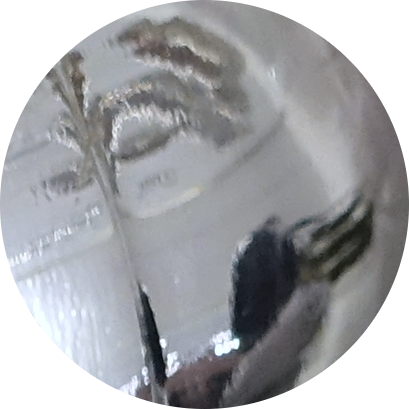 The filament in an incandescent light bulb is made from tungsten (but because of the danger of broken glass, only an adult should attempt to remove the filament, and then only with very great care). 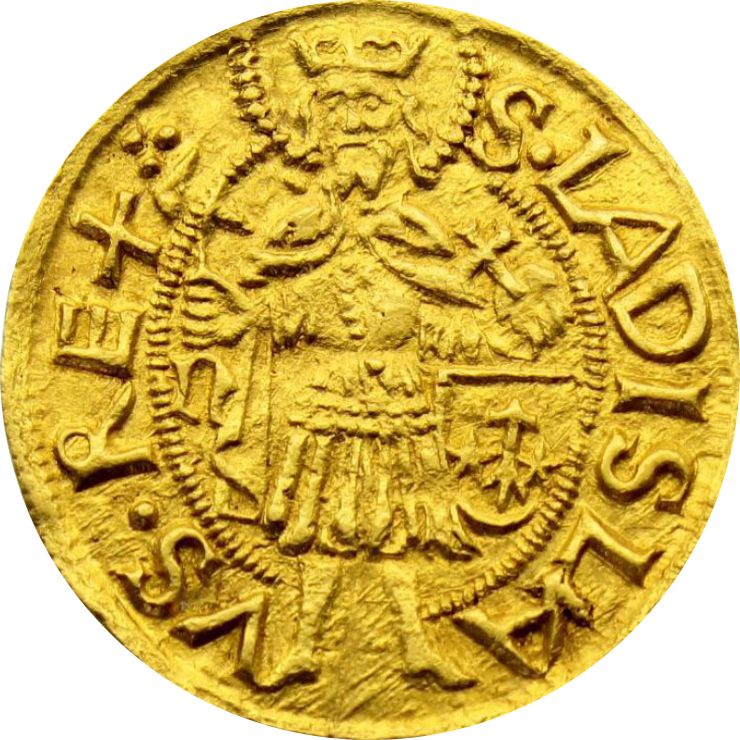 A gold coin, or a piece of gold jewellery, would make a truly wonderful addition to your collection. Alternatively, for under $10, science museums will sell impressive-looking bottles of gold leaf floating in liquid. 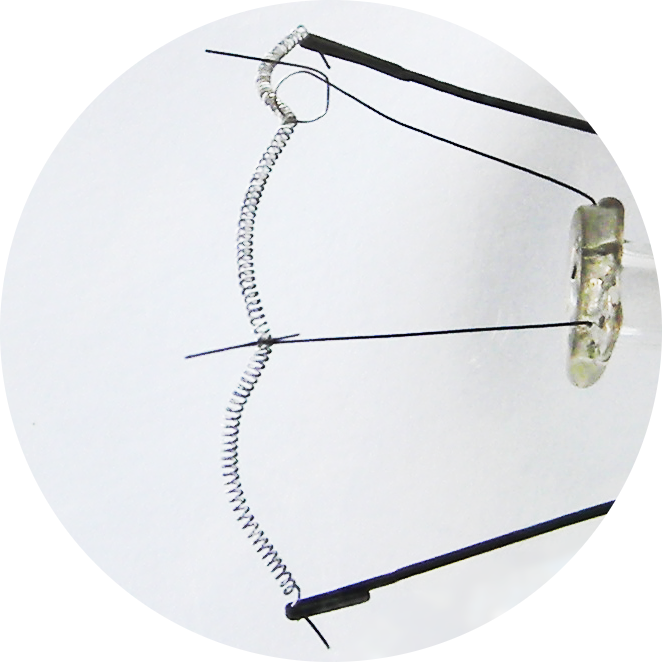 A fishing sinker is probably the easiest lead object to find.  So there you are. Those could be the first 24 elements in your collection! 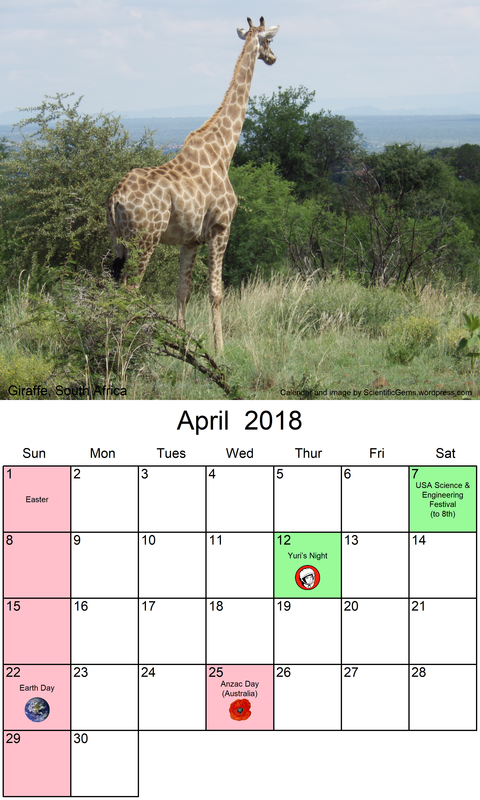 Here is the calendar for April (click for hi-res image). Yuri’s Night is coming up, along with some other events. See more calendars here. 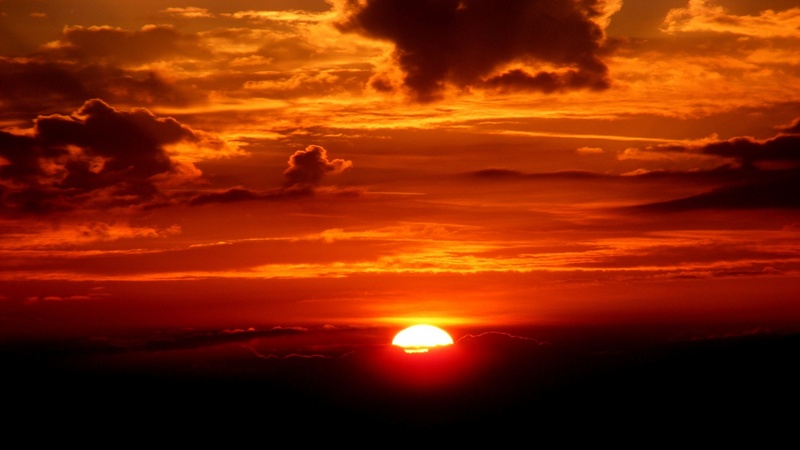 In reality, of course, the sun at sunset is a circular disk that gradually slips under the horizon. Oops. 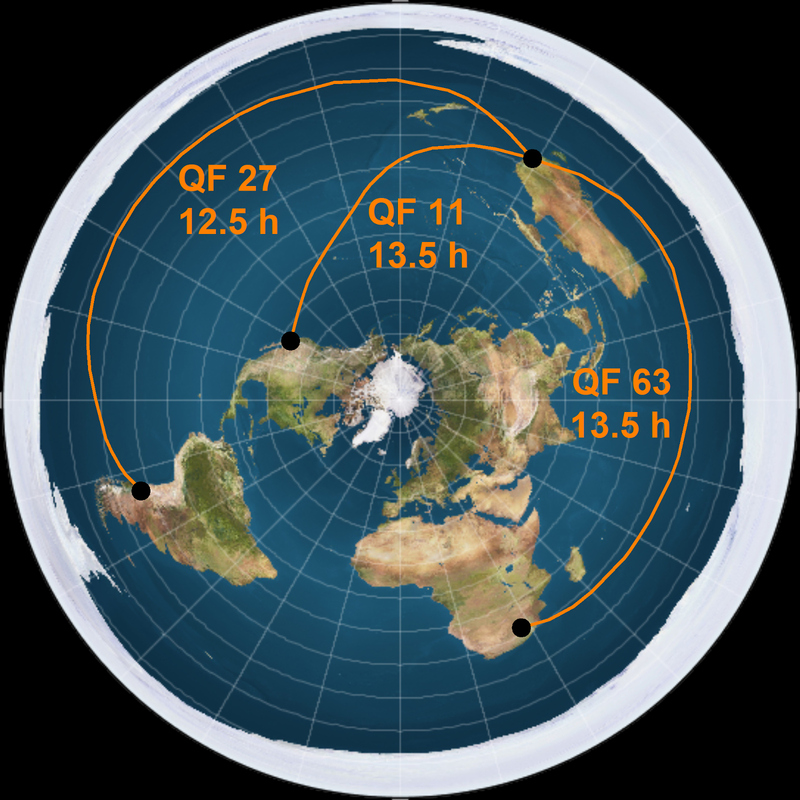 No, the earth is not flat.